With every other page turn in this fantastical whimsy of a story, your mind is blown out of this world and into another galaxy! Royal monitor heads, horned humanoid species battling winged humanoid species, magical powers and transportational vortexes (and that’s just the first eleven pages)! Saga delivers the reader into a world where anything does, and will, happen. From the first page to the last, you will continually stop reading to take a minute and wrap your head around what just happened; only for your brain to be whisked moments later and start the process over again. 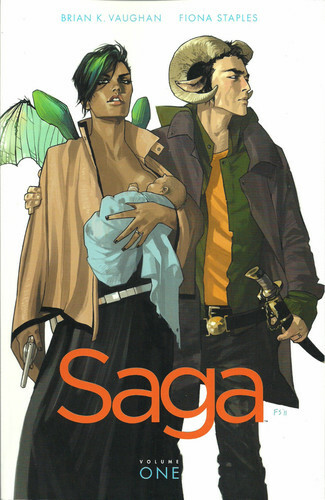 Saga has been named one of the best new series of the recent years. From Award winning author Brian K. Vaughan (if you haven’t read Y: The Last Man do so now) and fantastic artist Fiona Staples, it’s good to see the elixir of imaginative creativity is running swiftly through this new book! Vaughan continues to create interesting characters that the reader will only fall in love with, no matter which side of morality they lie. While Staples delivers gorgeous and grotesque character design to the book. What little criticism I could give, the environments could be better hashed out, but I am just knit picking by now. I can only say I am honestly excited to start the next volume. So… onward!